Chocolate Fountain Heaven would like to introduce our brand new Mirror Booth Hire, strike a pose, take that selfie! With every picture taken the mirror responds with a beautiful image of you! The pictures are then printed and your guests can take them away right there and then. It has a small footprint and is elegant in design to suit any event. If you are looking for something different that will take your wedding, party or corporate event to the next level you have definitely found it here. Guests approach the mirror booth. Photos print in less than 8 seconds. You will have a 4 x 6 print, that can be personalised before the event. A large number of guests can get in on the photo. 3 hrs hire, set up/delivery, operator, prints, props, unlimited fun. 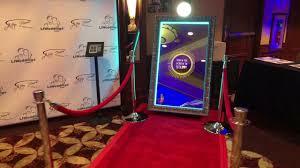 WHY HIRE A MAGIC MIRROR BOOTH FOR MY EVENT? Touch screen interface used to start the booth. A full photo ( show off all that wedding dress or outfit ). Print per entry and 1 for the photo book so that your guests can leave you a message. Can be set up in 30 minutes which reduces any disruption at your event. Best of all the mirror booth is fun, fun, fun.